For the past two-plus years, I have made a deliberate and concerted effort to down-size the stash. While I can plead that it was taking up too much space or I was not in love with all of it anymore, in truth, the primary motivation was an attempt to get from under the guilt of having so much yarn. 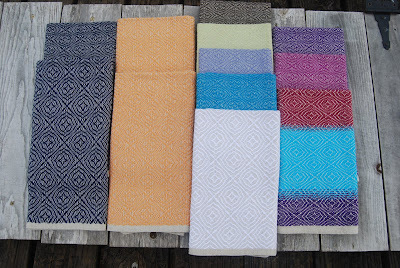 The initial destash went well with me pulling everything out for a thorough assessment. With my queue list in hand, the first pass required me to pair yarn with patterns,and I ended up with enough yarn to complete 34 sweaters, 14 of which were in MadelineTosh alone. No, there were not all for me, either. The third pass had me trying to convince myself I needed one or more of the remaining skeins, so I just stopped. In all, I had decreased the size of the stash by a third. Those that did not make the cut were parceled out to my knitting friends. That was well over two years ago. In the meantime, I made a concerted effort to knit down the stash. At present, I am slightly less than half of what I had. That is actually a good feeling, especially, as I have bought yarn here and there for projects that were knit immediately. This has lead to a realization of what I want my stash to actually be. There are a precious few knitters who are completely stash-less. 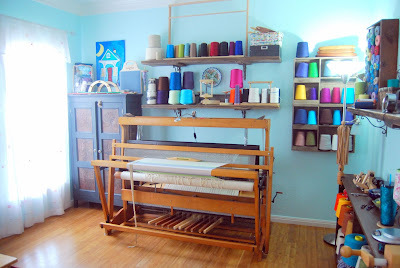 They seem to be mostly monogamous knitters who operate with one project, maybe two, at a time, and they purchase the yarn they need for a specific project as they go. 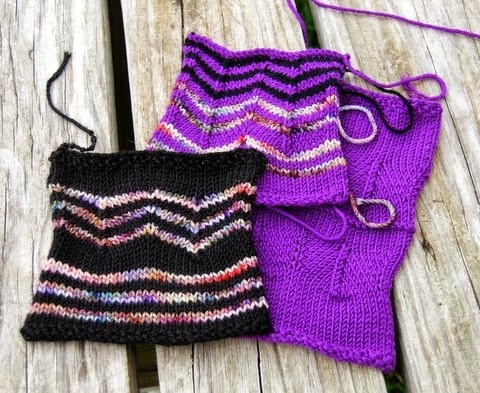 While I marvel at them, I know I will never be a stash-less knitter, nor do I want to be. My goal is to have enough yarn on hand to be able to approach my stash when I am in the mood to begin something new and let a special skein of yarn tell me what it wants to be, whether that is a shawl, socks, or a sweater. However, tastes and needs change over time. When I began buying sweater quantities of yarn (and yes, I am talking about you, my MadTosh stash), I was in love with the colors and quite concerned if I did not buy it when I saw it, I would never see it again or find anything remotely similar to the beauty in front of me. I also had three hand-knit sweaters to my name. So, I admit, I may have gotten carried away a bit. At the moment, I have a couple of dozen hand-knit sweaters, and the harsh reality of South Texas in the winter is that there are a good five or six days in which I can comfortably wear them, particularly the worsted ones. 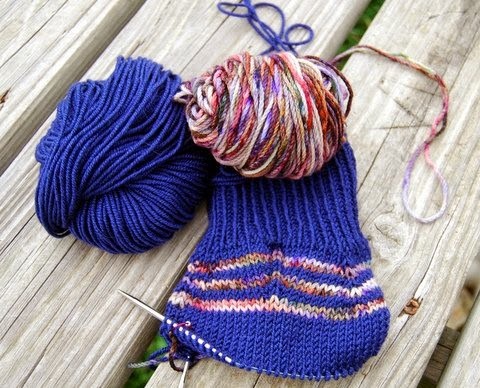 For me, there is a balance here between having just enough yarn on hand to fulfill the desire to start a new project the exact nanosecond that desire strikes and not having too much yarn that I become burdened by it. There is a third compelling argument for keeping a large stash, but in an attempt to be reasonable, I will merely acknowledge the ever-present threat of a knitting emergency when the world has gone to complete hell and yarn, gasp, is no longer readily available, and state: I am not planning on that particularly contingency. The big question then becomes, how has this systematic stash down worked for me? The good news is there is satisfaction in using what one already has. The reality is, unless I still want to knit the pattern with which the particularly yarn was originally paired, I have problems. 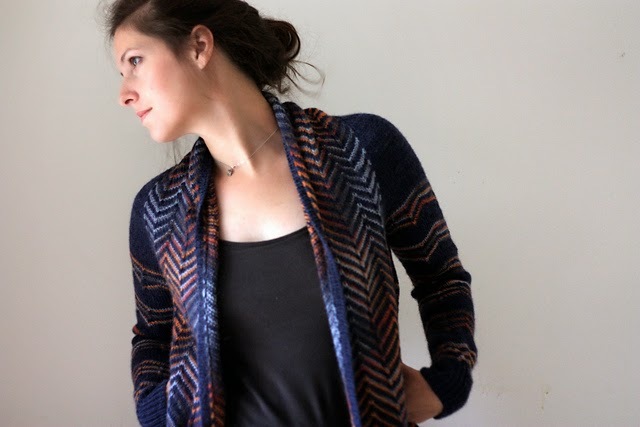 A couple of weeks ago, I decided I wanted to knit the Maxfield Cardigan by Amy Christoffers. The gauge was perfect! The only problem was I did not have a contrasting variegated yarn to go with it in the stash. At first, I thought I could pair it with some Malabrigo Arroyo, a skein of which I had in black to swatch with to see if the slight diameter differences would still work. The thought was to find a variegated color after I swatched with the black. It did not work. The Arroyo was a tad too thin. With nothing else to swatch with, I had to take a chance and try to find a yarn online that would work color-wise, as well as yarn-wise. I eventually decided to go with Koigu Kersti. It was a long several days wait to receive the package, but as soon as it arrived, I immediately cast on to swatch again. Diving into the stash again, I found some black Valley Yarns Northfield set aside for a cardigan for the Wee child. While I was not going to re-purpose this stash item (she promises to wear it, if I knit it! ), I thought it would work well with the Kersti. It did, sort of. The gauge was perfect, but the color combination was slightly off. To make the sweater using what I already had (meaning now the just purchased Kersti), I had to turn around and order more Northfield, this time in Navy Blue. It came in, but instead of swatching, I simply cast on. Both yarns are lovely, and I am pleased with the result; however, had I set out originally to purchase yarn for this project, these would not have been my first choices. These purchases were made when I tried to use the stash on hand. No. 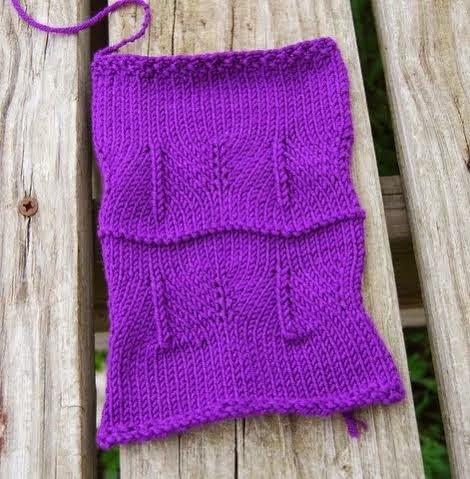 The Kersti yarn is not something I had tried before, and it is delightful to work with. I do like weight of the Northfield and Kersti together and anticipate getting a lot of wear out of this sweater because it is a cardigan and it is, of course, lighter weight than the worsted and Aran sweaters I have. The lesson for me here: I should not try to supplement something new to make do with what I have in the stash. If what I have works, I should absolutely use it! But, if it doesn't, I must find something I love that does. In the meantime, I will continue to find projects in the stash, while I cultivate a list of hand-knit worthy friends who can make good use of really nice (I am talking to you, again, MadTosh), heavy sweaters. Anyone else have issues with their stash? Nope!!! I live in Minnesota and it is additional insulation for my house. That's my story and I' sticking to it!!! That works for me, Maria!